Stefanutto was restricted most of the time to a hospital bed, only ever leaving when he needed to be transported via stretcher to a different hospital. 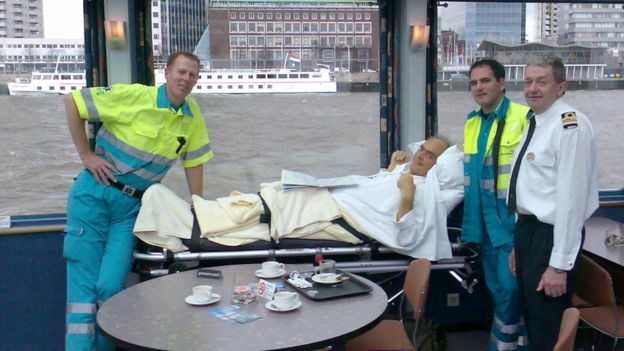 But in November 2006, after a delay by the receiving hospital and having no desire to go back to the same bed he had just spent three months in, Stefanutto asked Veldboer if he would take him to the Vlaardingen Canal so he could be near the water and say goodbye to the Rotterdam harbour. It was then that Veldboer asked him the question, and realizing that Veldboer was going to do everything in his power to make his wish come true, tears of joy ran down his face. The following week, with help from Veldboer and his colleagues and a boat touring company, Steffanutto sailed the canal one last time. The emotional response that Veldboer received from Stefanutto prompted him to start the Ambulance Wish Foundation. Based in the Netherlands, the foundation has over 230 volunteers and has so far granted almost 7,000 wishes, according to BBC News. The charity helps four people a day, and they can be any age. The only requirement – they have to be terminally ill and transportable only by stretcher. One trip took Mario, a 54-year-old with learning disabilities, to say a final goodbye to his colleagues at Rotterdam’s Diergaarde Blijdorp Zoo. He worked there for 25 years as a maintenance man and would always visit the animals at the end of his shift. Mario got to visit the animals one last time, and even received a giant lick from one of his favourite giraffes. The youngest patient that the foundation has helped so far was just 10 months old. She was in a children’s hospice and had never seen her own house. Her parents wished to bring her out of the hospice to simply sit with her in their home. The oldest patient so far was 101 years old. She wished to ride a horse one last time. They lifted her onto the horse and later took her for a ride in a horse-drawn carriage. According to BBC, the ambulance wish foundation is the first wish foundation ever to provide an ambulance and full medical backup. A fully trained nurse is always on board as well as specialist drivers who have police and fire backgrounds. The ambulances offer the patients a view of the outside, and each patient receives a teddy bear named Mario – after Stefanutto, the man who inspired it all.